Search.hinstantconverternow.com is the PUP that uses misleading techniques to prevent removal. Use Reimage to locate malicious components and get rid of them faster than with uninstall instructions. A full system scan blocks virus reappearance and prevents traffic to malicious domains. Search.hinstantconverternow.com is a browser hijacker created by Polarity Technologies Ltd. Although users might find the file conversion feature useful, they soon notice that hijacker's rerouting tendencies, invasive advertisement, and fake search results significantly diminish their browsing experience on a daily basis. These unpleasant features are accompanied by an altered address of the start page and the new tab URL (it is set to hxxp://search.hinstantconverternow.com). 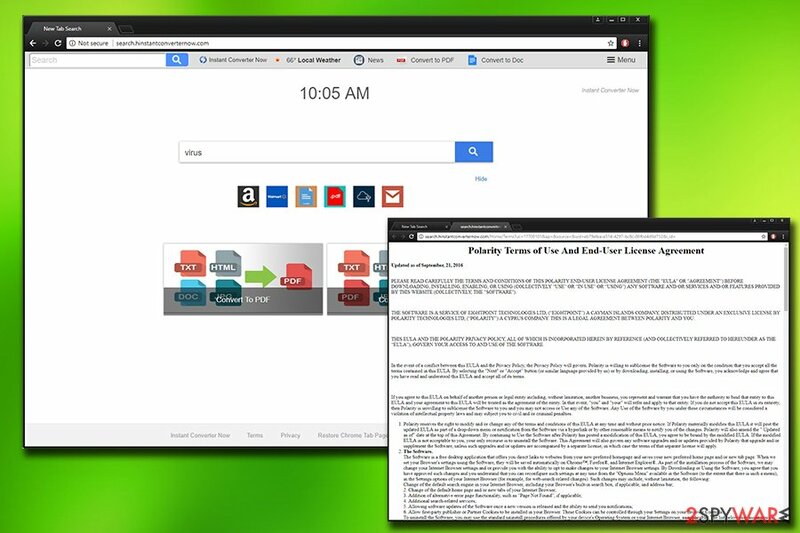 Hijacker homepage and search engine, altered search results, intrusive ads, etc. All the search results that users enter into modified search engine bring out results from Yahoo. Although there is nothing wrong with Yahoo and it is a legitimate browsing tool, if the search query is rerouted from Instant Converter Now, users will see multiple sponsored links leading to partners' websites. Polarity earns money for every single click made (pay-per-click scheme is used). Instead of using a hijacked Chrome, Firefox, Explorer or Safari search engine, better remove Search.hinstantconverternow.com virus from your machine and use Yahoo, Google, Bing or other legitimate tools. Additionally, Polarity collects a variety of information about you that may be shared with third-parties. Such info includes search data, browser information, software data, IP address, ISP used, etc. Yes, Polarity knows everything about you, including which domains you visit, how long you stay there and which links you click. To avoid such intensive spying, you should take care of Search.hinstantconverternow.com removal immediately. You can check our detailed instructions below this post or get rid of it using professional security software (we recommend Reimage, although any other legitimate security tool will do the job). Potentially unwanted programs are called so for a reason – users do not install them intentionally. Some security experts even go as far as calling this software “legal malware” as its usage can lead to severe computer infections. However, developers or such applications often go out of their way to install them onto as many users' PCs as possible. The most prominent distribution method is software bundling – a not so fair marketing campaign used by freeware authors. Nevertheless, there is something you can do about it. The first step to computer safety is caution and awareness. When installing freeware or shareware, make sure you pick Advanced or Custom installation mode instead of Recommended one. The latter will not allow you to view additional components and get rid of them before the installation of the desired application is complete. Additionally, make sure you never click “Next” button several times as you might skip the step where you agree to Terms of the app. Although Search.hinstantconverternow.com removal can be performed manually, we do not recommend this method for users who are not that familiar with computing technologies. The manual guide might be too complicated to regular computer users and might result in the elimination failure. Nevertheless, if you are computer-savvy enough, proceed with this method carefully (it might take some time). For those users who want to remove Search.hinstantconverternow.com virus quickly, security experts recommend relying on reputable anti-virus software. Simply download the program and run a full system scan. Here, look for Search.hinstantconverternow.com or any other recently installed suspicious programs. Wait until you see Applications folder and look for Search.hinstantconverternow.com or any other suspicious programs on it. Now right click on every of such entries and select Move to Trash. When in the new window, check Delete personal settings and select Reset again to complete Search.hinstantconverternow.com removal. Once these steps are finished, Search.hinstantconverternow.com should be removed from your Microsoft Edge browser. Here, select Search.hinstantconverternow.com and other questionable plugins. Click Remove to delete these entries. Now you will see Reset Firefox to its default state message with Reset Firefox button. 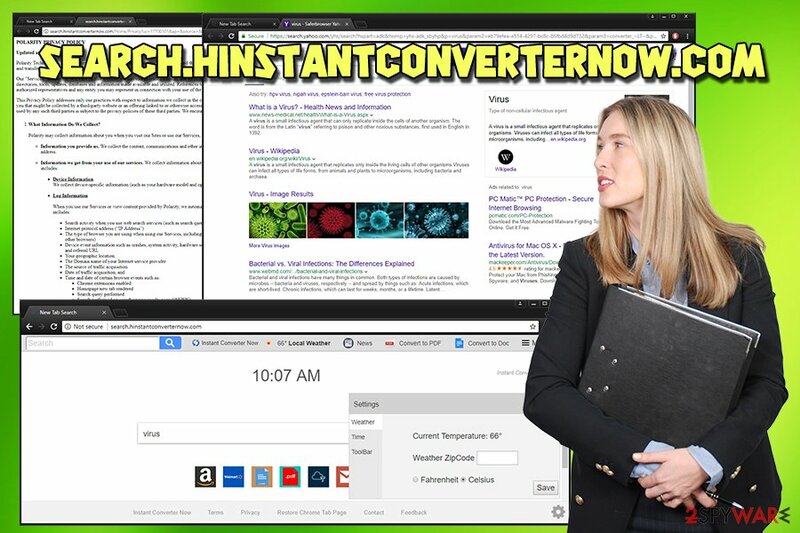 Click this button for several times and complete Search.hinstantconverternow.com removal. Here, select Search.hinstantconverternow.com and other malicious plugins and select trash icon to delete these entries. Click Reset to confirm this action and complete Search.hinstantconverternow.com removal. Here, select Extensions and look for Search.hinstantconverternow.com or other suspicious entries. Click on the Uninstall button to get rid each of them. Here, look at the Homepage field. If it was altered by Search.hinstantconverternow.com, remove unwanted link and enter the one that you want to use for your searches. Remember to include the "http://" before typing in the address of the page. Now you will see a detailed dialog window filled with reset options. All of those options are usually checked, but you can specify which of them you want to reset. Click the Reset button to complete Search.hinstantconverternow.com removal process. ^ Browser hijacker. Malwarebytes Labs. Security researchers. ^ How Can I Identify a Phishing Website or Email?. Yahoo. Safety Center. ^ LosVirus. LosVirus. Spanish cybersecurity specialists. This entry was posted on 2018-05-28 at 02:15 and is filed under Stealing programs, Viruses. You can quickly scan the QR code with your mobile device and have Search.hinstantconverternow.com manual removal instructions right in your pocket. 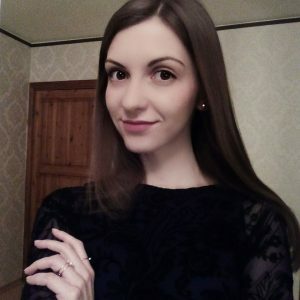 How did you remove Search.hinstantconverternow.com?